Receive a $100 FREE bet! $100 Refer a Friend bonus! In an ideal world, you should be able to place a bet anywhere and anytime! Betting should be exceptionally simple as the inspiration could strike from anywhere. You could be in the office, at a restaurant with friends, in a pub or even in a truck when your betting finger begins to itch. Sportsbet by Sportsbet.com.au is now available to help anyone who is ready and willing to place a bet today. Sportsbet is a highly convenient and quick betting app that makes the process of betting easier for everyone. Simply put, placing bets has never been this fun and easy, you can even multitask and place your bets as you complete other tasks! 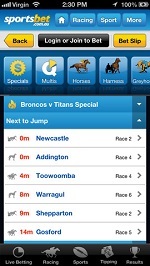 Available on iTunes, Sportsbet app allows you to get more than ordinary bets. Users can enjoy an array of benefits ranging from placing bets, win, multis, quaddies, exotics and more. With access to over 1,000 sports betting markets, the app provides brilliant selections of racing markets too. All available round the clock for you. 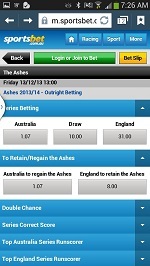 Just like their website Sportsbet.com.au offers. Some of the benefits of Sportsbet include the ability to view bet and transaction history, all while allowing you to quickly to tell your current position in regards to pending and resulted multis. Both new and current Sportsbet users can deposit funds into their account for smooth transactions. The betting experience from this application is just awesome! This is all you have been looking for to start enjoying the best online betting experience. The application is available for download on iTunes. Bet anywhere, anytime without complexity thanks to Sportsbet!